This wardrobe has two doors hiding an area for hanging clothes. The sides of the of the Flat Shaker wardrobe cabinets are flush which make possible to use multiple units side by side to make a larger closet system. 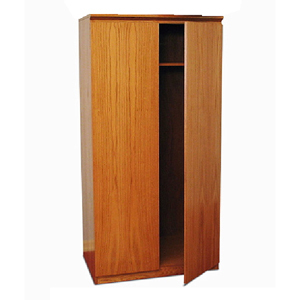 This armoire can also be combined with Ridg Top(storage top) for additional storage. Our matching Ridge 1(armoire), and Ridge 3(chiffonier) can be used to make a modular wall unit for a variety of kinds of storage. Colors can be mixed and matched or Solid Color as you like. Please see color chart for available colors. Strong Construction. Price shown is for Melamin. Can be made of Shop Birch or Oak Wood at additional cost. This Wardrobe Is Also Available In Custom Size. If You Would Like A Particular Size, Please Indicate The Size In The Shipping Comments Box Or Contact Us Via Email Or Telephone. This Wardrobe Is Shipped Fully Assembled.